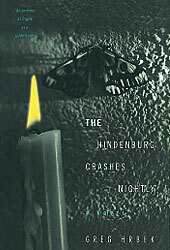 Enduring love and tangled family relationships are at the core of Greg Hrbek's first novel, The Hindenberg Crashes Nightly. In it Hrbek tells the story of Tom Markham, whose 20-year love for a woman named Lindsey Paris-an obsessive, romantic love born in young friendship at the time of his mother's death during childbirth-endures time, separation, and Lindsey's marriage. While Tom, who works as a clay puppet animator for a religious children's show, orchestrates his little clay characters' every move, his own life is chaotic, its course beyond his control. Complicated relationships with his own emotionally disturbed brother; Lindsey's avuncular husband (ignorant of their affair, he helps Tom get his puppeteering job), and a woman who is lover in turn to Lindsey and Tom force Tom-and the reader-to ponder the nature of romantic, filial, and fraternal love. The interminglings of these intense characters, and the lyrical prose in which they are related, took Hrbek five years to develop. In a telephone interview, Hrbek said he spent two years at the Iowa Writers Workshop crafting this novel, which began as a somewhat conventional coming-of-age story. But after a while, the author found himself "straightjacketed by realism," and started thinking about unfolding the story in a nonlinear fashion. Now, The Hindenberg Crashes Nightly shuttles between segments about Tom the adult and those relating to Tom the child. Said the author, "I like the effect that a writer or filmmaker can create of the future being revealed before the past, of childhood contextualized by adulthood, instead of the other way around." A slow writer and self-described perfectionist, Hrbek has had the opportunity to devote himself to writing for much of the time since graduating from Vassar. After two years at Iowa working towards an M.F.A. degree, the author won a James Michener fellowship, which allowed him to spend a year in California writing his novel. After that, he returned to Vassar, this time to teach half-time in the English department while still working on the book. In the past year, Hrbek has been tackling a full teaching load at Butler University in Indiana, a position that has somewhat crimped his productivity as a novelist. But come the fall, he'll be moving to Princeton University to spend a year in a writer-in-residence fellowship, a development he calls "miraculous," since it entails no teaching responsibilities. He'll use the time to work on a new novel, an excerpt of which was published in Harper's Magazine this past winter. Although still in its early stages, this new book, Hrbek says, is a bit more speculative than his earlier work, taking even greater liberties with the rules of traditional realism. Fans of Jane Smiley's novels have had to accept the fact-both wonderful and maddening-that Smiley never writes the same thing twice. Whether she's spinning a mystery in Duplicate Keys, recreating an ancient world in The Greenlanders, revisiting a Shakespearean classic in A Thousand Acres or skewering academia in Moo, she is constantly suprising her readers. In her latest novel, Horse Heaven, Smiley uses one of her own passions-raising horses-to create a wickedly funny novel about the world of racing. (Smiley herself now lives in California with her three children, three dogs, and 16 horses). In Horse Heaven, she presents a cast of characters that includes not only the owners, trainers, riders, and gamblers, but also-amazingly-the horses themselves. With names like Epic Steam, Limitless, Justa Bob, and Mr. T., these equine characters come to life as fully and as richly as do their human counterparts. Mr. T did not need a nap. No one who fulfills a long-standing passion to be once again a long-legged colt, flowing with movement and energy, needs a nap, at least not until the next day, when the aches and pains set in, and you can barely hobble around your own personal Arabian-fantasy domain and even the precious-as-emeralds-and-rubies irrigated grass doesn't look quite so good as a quiet doze in the shade.